Obviously you won’t need a tool to get more friends aka ‘following’ on twitter but you’ll add more friends when you tried our new feature called ‘friend search’. But let me start from the beginning of our recent, major technology shift for jetwick.com – our open source twitter search. We have now moved the search server forward to ElasticSearch (from Solr) – more on that in a later post. This move will hopefully solve some data actuality problems but also make more tweets available in jetwick. All features should work as before. Finally select ‘Only Friends’ as the user filter. 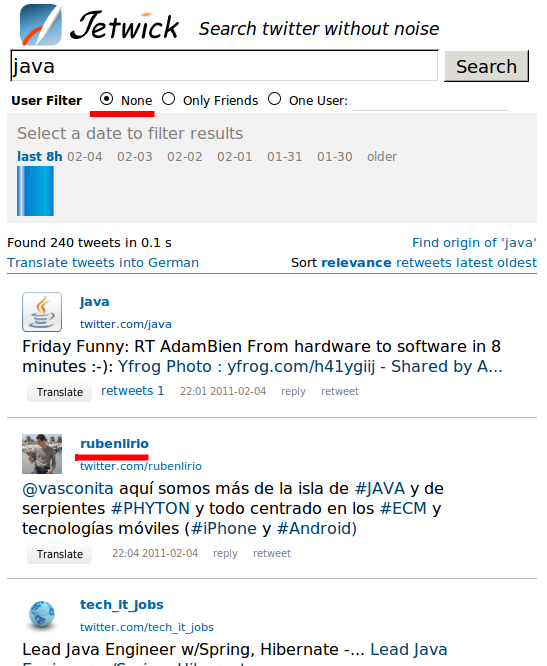 Now you are able to search all the tweets of the people you follow. You don’t need to stay on-line all the time – jetwick automagically grab the tweets of your friends for you. And if you use the relaxed saved searches, then you’ll also be notified for all changes in you homeline – even after days! That was the missing puzzle piece for me to be able to stay away from twitter and PC – no need to check every hour for the latest tweets in my homeline or my “twitter – saved searches”. Jetwick is free so you’ll only need to login and try it! As a side effect of being logged in: your own tweets will be archived and you can search them though the established user search. 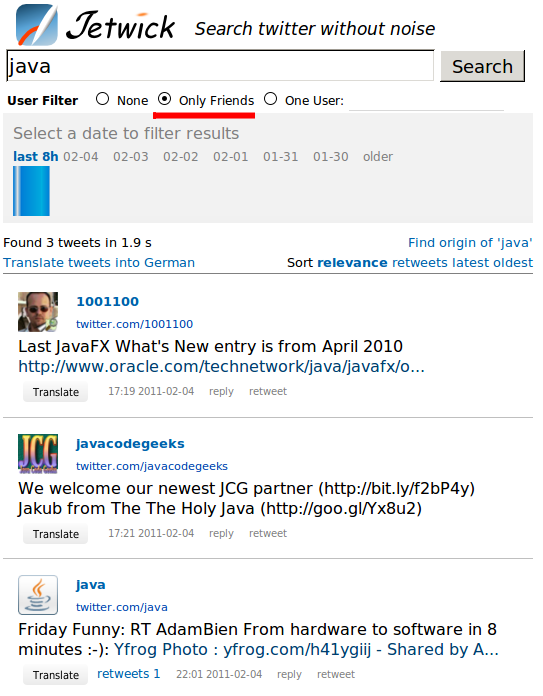 With that user search you can use twitter as a bookmark application as I’m already doing it … BTW: you’ll notice the orange tweet which is a free ad: just create a tweet containing #jetwick and it’ll be shown on top of matching searches.